Hey guys! Long time no post. For the past couple of weeks, I have been quite busy with things in life like work, dyeing people's hair, work, working on the side room of the house, helping parents with paperworks, work (you get the idea), and preparing & packing for the much needed Myrtle Beach trip. Every year, my usual peeps and I would plan a trip together and this year, we decided on Myrtle Beach, SC! 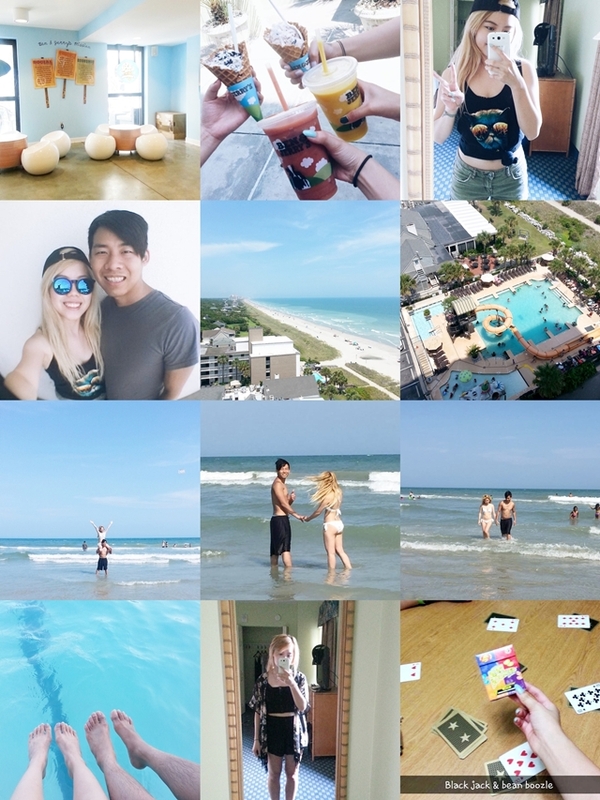 This is our first trip going south together and for many of us, it was our first time at Myrtle. My sister and I visited Myrtle Beach when we were toddlers, but we have no recollection of it at all besides pictures so this was like our "first time" at Myrtle, too. We stayed for three days and two nights. I had tried vlogging, but it didn't work out since I was too afraid to carry my dslr around the beach and my point and shoot camera was really old and couldn't record well. Most pictures were taken on my phone which is out-dated (I have the S3), so I'm sorry for these low quality pictures. Trust me, the view and everything looked 100214893975x better in person. Definitely took the most photos the first day of basically everything. We spent most of our day exploring the area and the hotel. Because we didn't stay in one area for too long, there isn't much I can say we did haha. We just explored and tried to get the basic overview of all there was to do in this place. We were all tired from walking around so much, that we just ordered take out in the evening and played games. We were more familiar with where everything is and spent most of our day at the beach tanning and playing in the water. This was the day that I got the tannest. For dinner we ate at a buffet and stuffed ourselves. We definitely ate our dollars worth! This was also our last day and we were actually planning to stay up as long as we could so we spent the rest of the evening at the hotel playing poker, black jack, and bean boozle. Our last day...*cries* All of us did not want to go home yet. We had so much fun. We spent the last hours exploring the boardwalk some more and getting little souvenirs to remember this place. Bf and I decided to go on the Skywheel since he knew that I wanted to ride it since Day One lol. He was afraid of heights so this was definitely for me. If you follow me on snapchat than you would have seen his reactions. It was hilarious! Okay, enough teasing him haha. He did somewhat conquered his fear after the third time around (each ride is three turns around the wheel). I had a great time up on the ferris wheel. On our way back home, we stopped by a crepes place. It was a lot of our first times eating crepes, too and the place we found had the nicest server. She was very, very pleasant which made the ending of our trip even better! I still miss Myrtle Beach so much! 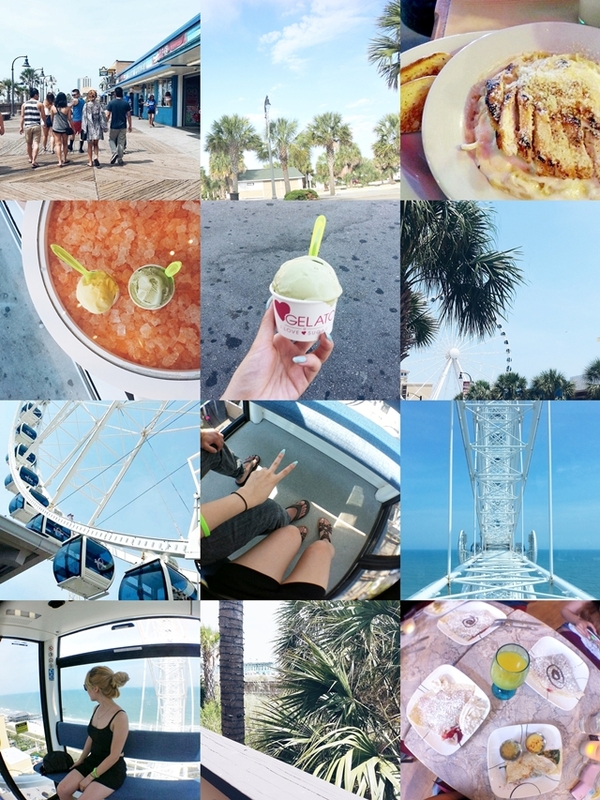 If you follow me on instagram, you know that I am milking the photos I took from this trip. I'm sorry if you are tired of seeing my beach photos haha. I know I should have posted them while I was on the trip, but I was busy enjoying it and capturing the moments and didn't have time to edit and post them up haha. Also, I didn't want to spam them all at once so here is a collection of them on my blog. I should resume back to more regular postings now since all the vacation-planning and going is over. Can't wait to show you guys what I have in store! You should definitely visit one day! I felt like I was in Cali with all the palm trees around lol.